Having three Goldens one can only imagine the amount of time spent keeping them clean and fresh. Lucky for us, they all enjoy taking baths but sometimes we just don't have the time. When it comes to keeping your dogs clean you want to do it safely by using products that are gentle on their skin and coat. We were recently given the chance to try a few Isle of Dogs™ products on the Goldens and we couldn't wait to share them with you and give you a chance to win some for yourself! 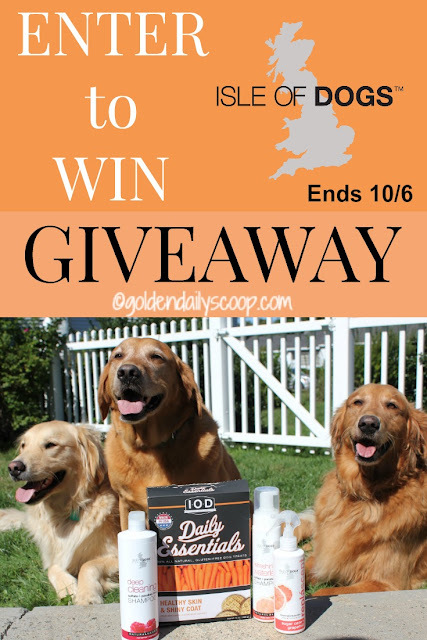 Disclaimer: Golden Daily Scoop received a box of Isle of Dogs Daily Essentials, Shampoo, Waterless Shampoo and Odor Neutralizer in exchange for our honest review. We received no other compensation and Isle of Dogs is not responsible for the content of this post. Isle of Dogs combines superior grooming products with premium natural treats and supplements to promote wellness and beauty. 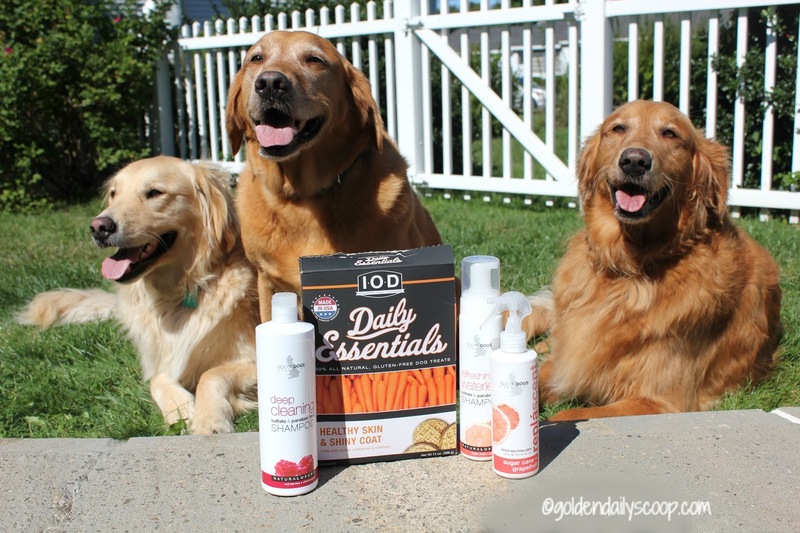 Their proprietary line of canine health and beauty products are sourced and made in the USA. This Everyday NaturalLuxury Shampoo is specifically created with a gentle sulfate and paraben free formula. This particular scent is red berries + champagne - need I say more? The only way I can describe it is light, clean and refreshing. Not only did I love the scent, but it really got the grime out of Miley's double coat. It really cut through the dirt, rinsed out easily and as you can see in the picture above, left her coat feeling soft and shiny. Also part of the Everyday NaturalLuxury line the Refreshing Waterless Shampoo is also sulfate and paraben free, this waterless shampoo gets the job done without, you guessed it - water! Let me just say Waterless Shampoo is GENIUS! There's a thousand reasons to have this on hand at home, here are a few of our favorites. Your dog doesn't enjoy baths. 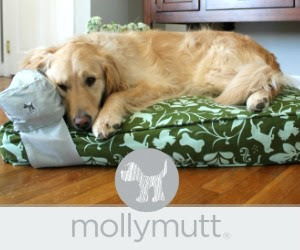 Great for removing stains from light colored dogs. It's so simple to use, just pump a good amount onto your hand and rub into their coat, then dry with a towel. It dries quickly without leaving a sticky residue behind. Like I said, GENIUS! Repláscent is an odor neutralizing spray that is safe for your dog and around the home. It neutralizes odors and replaces them with a light and refreshing scent. The one we tried is sugar cane + grapefruit. Mmmm, I think this is my favorite scent of all. 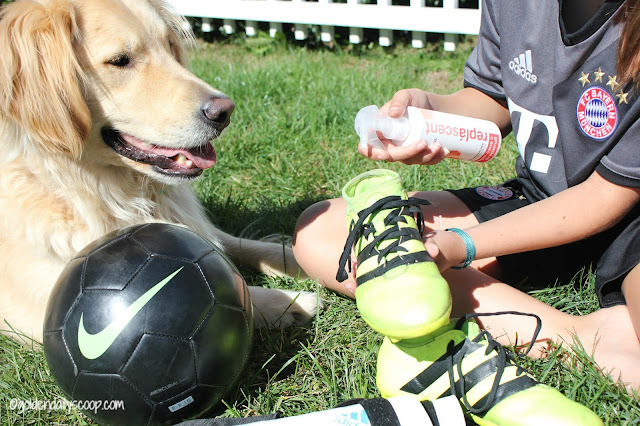 As soon as I learned it was safe for dogs and around the house, I knew exactly who and what I was going to try it out on. 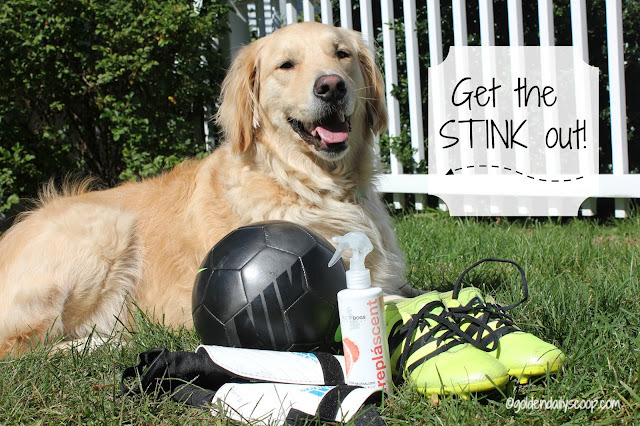 First source: Bruin, our only boy of the Goldens and man does he like to stink it up! After playing in the yard, he comes inside and has a rather unpleasant odor on him. I don't know what he gets into or rolls in but it stays with him and stinks up the house. 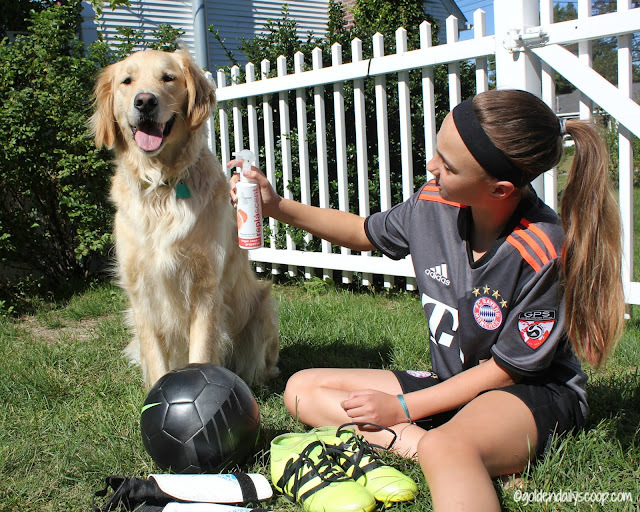 I love that it is safe enough to spray right onto his coat, so quick and easy we have the kids do it! Second source: soccer cleats. Eww. Eww. Eww. There is nothing quite like the smell of ripe cleats. Nothing. But I am happy to report that this spray definitely gets the job done. The only thing I can find disappointing about this spray is that I didn't find it sooner, what a life and nose saver! The Odor Neutralizer contains no toxic chemicals, parabens, petrochemicals, animal by-products, and no lab animal testing. 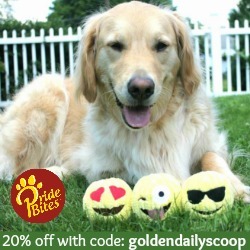 Now that we have the Goldens all clean and smelling fresh, lets fill up their bellies with some whole food goodness! 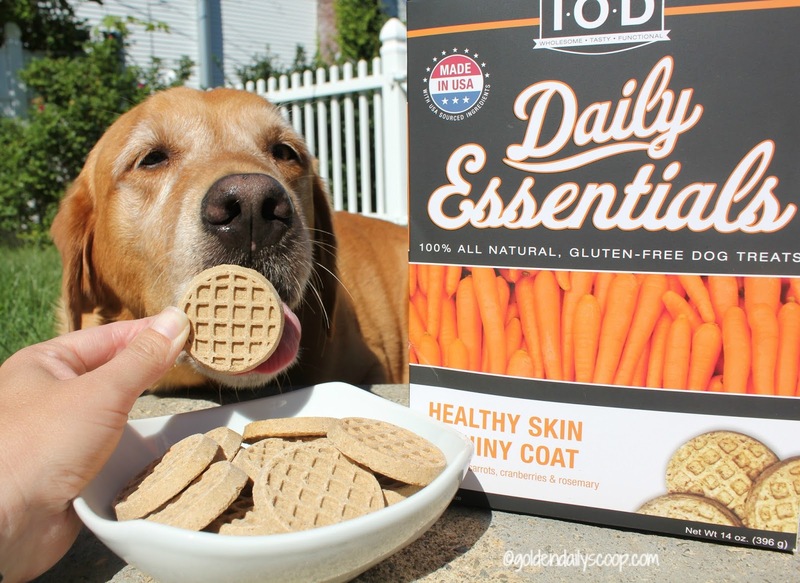 Daily Essentials are crunchy all natural treats that deliver healthy nutrients from grains, fruits, vegetables and herbs. 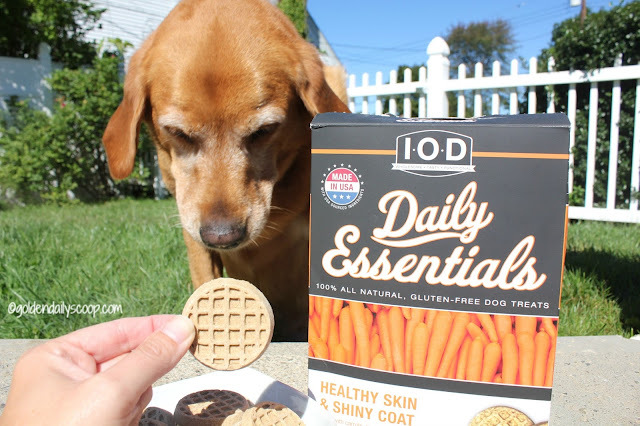 Maggie tried the Carrots, Cranberries & Rosemary treats and loved them! These treats are made with a pumpkin base, making them gluten-free with no addition of synthetic vitamins, fillers or additives. Best of all, they are made in the USA! As you can see these treats are large which you will never hear the Goldens complain about. If you happen to have a smaller dog, they can be easily broken into smaller pieces. 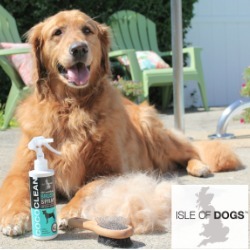 We give the Isle of Dogs products a GOLDEN PAWS UP! They definitely get the job done while leaving a light sweet scent which can only mean two things, extras cuddles and healthy treats! 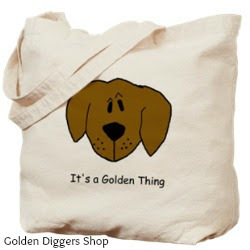 You can purchase Isle of Dogs products via their website. Since collies are double coated, we are always looking for safe, effective grooming products! Thanks for the info! Shunta would reallu like the Daily Essentials treats for healthy skin. When Tallulah was a tiny puppy, her breeder sent us home with Isle of Dogs shampoo. Loved it, and Tallulah has loved bath time ever since. I pinned the waterless shampoo. Harper Lee does pet therapy visits. She's supposed to have a bath before each visit, but sometimes she has a couple of visits scheduled within a few weeks. This is perfect for when she needs to be clean but I don't really want to bathe her again in such a short space of time. Thanks for the review! It looks like they have some great products. I want to try some of their shampoo. I think the Deep Clean Shampoo would be best for our brand new rescue doggy! They'd all be great for my dog, especially the Waterless Shampoo. Thanks. we would enjoy the waterless shampoo! We've started taking our dog to a groomer on a regular basis, but occasionally we will bathe him at home. This shampoo sounds great! And I would love to try out the Odor Neutralizer around the house. we would love that shampoo! sometimes we arent too thrilled about taking a bath! My samoyed is tough to pin down in the tub, so waterless shampoo would be awesome! we would love to try the evening primrose oil shampp! I think my dog would like the Refreshing Waterless Shampoo the most. She doesn't like to take baths sometimes. We really enjoyed the IOD products we tried! I especially love the deodorizing spray. The waterless shampoo really got my attention! I always need something between baths fur my Husky, Icy. She gets so stinky! I want to try the Odor Neutralizer. My two boys get stinky all the time. I like using waterless shampoo on Mr. N after he eats his raw bones so he doesn't rub his face all over the carpet! Looks great! Also, your pups are GORGEOUS! Henry is a little anxious guy and gets nervous about dry shampoo, but I think we could make it work with a little more training ;) Love the berries + champagne scent! My dogs would love the treats! But I'd love to try the conditioning sprays. Such gorgeous pups - their coats are so shiny and healthy! Love the sounds of some of those product scents too! 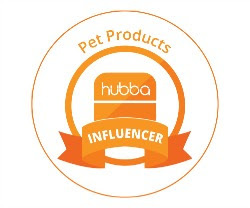 I only use the most natural products I can find for my pets, and this company seems to have a nice range of them. Seems worth looking into. Oh I think the Refreshing Waterless Shampoo would be so perfect for my senior. His skin gets dry and itchy so easily, and he hates baths. This would be so wonderful and I think it would really help his skin! Definitely would like to try Refreshing Waterless Shampoo - Ramble in all his furlessness dislikes bath and his last one was traumatizing to both of us! My Boston could use some waterless shampoo for his face. He gets so scared when the water goes past his neck because his nose is so mushed and he inhales so much water that I stopped washing his face. I'd love to try the waterless shampoo. I'd be interested in trying the waterless shampoo. My rescue is scared of baths. I think the Refreshing Waterless Shampoo would be beat for my husky Titan. My dogs would probably benefit the most from the Joint Soft & Chewy Dog Treats - Featuring Glucosamine & Chondroitin. I have all seniors. there are 2 that i really like, the Refreshing Waterless Shampoo and the No. 18 Black Coat Evening Primrose Oil Shampoo. my dog breeder love their shampoo. she buys it by the case for her show dogs. it is really good for black, grey dogs. enhances their coats. I need every single one of these products, especially the Refreshing Waterless Shampoo!! I have two labs who love water but HATE bath time (go figure) and a pit bull who loves to try to eat the water when it comes out of end of the hose but thinks bath time is about as offensive as it gets ;-) My oldest girl could really benefit from theJoint Soft & Chewy treats. My little Rosa doesnt like her bath very much. This sounds like a great idea to use with her! Hahaha Loved the use for freshening the shoes, too funny. And they look silky smooth. Thanks for the great review. These products sound great! I love the idea of waterless shampoo. Having cats, I truly understand how important it is to be able to remove a stench without a full on bath. I wonder if any of these products can be used on cats? Your dogs are really happy about those treats too! I love the idea of the waterless shampoo. 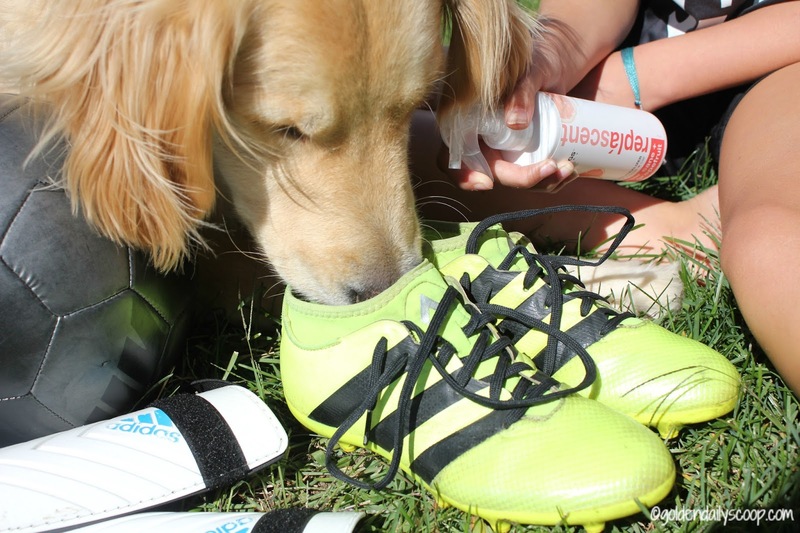 My son's service dog could definitely use this to help her smell and look good, since she is constantly on the go. However I think that the best product of all the Isle of Dogs items would be the Joint Soft & Chewy treats. We want to make sure to protect our sweet Biscuit's joints since she has to keep up with my son's high energy. The waterless shampoo sounds like a really great product. It would be perfect for my huskies! These sound like great products! One of my dogs suffers from allergies, so I am always trying to find gentle solutions for her. Your pictures are adorable!! Such a lovely family!! This would be a great for James, because he tends to get smelly fast!! Haha! 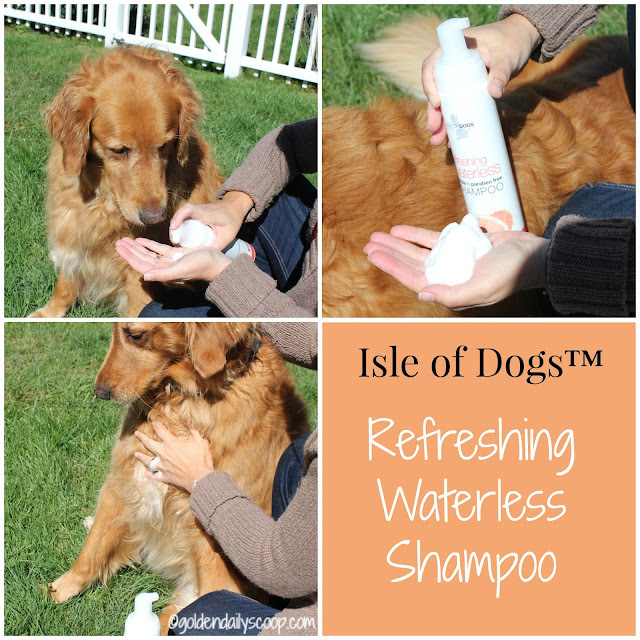 We would love to try the waterless shampoo! Waterless shampoo sounds like a great idea to us. I live on a farm so my dogs need the deep cleaning shampoo. What a great range of products. Maggie did get the whole bowl of biccies... Didn't she!? My pooches would really enjoy the treats. They hate baths, but I think these products look awesome. 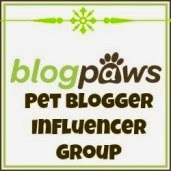 The Deep Clean Shampoo would be great for my stinky 3 rescue pups they need it. The oatmeal shampoo and conditioner are the best!